Today’s card is the second of the four cards that I made for the card gift boxes I posted here. For this card, I wanted to use a doily as part of the main focal point and decided to use a Die-namics pierced circle in front of it. I just used a small strip of patterned paper on the background, as the doily takes up a lot of the card and added two stars to balance out the card. For the sentiment, I used the Clearly Besotted Tag Along stamp set on a tag from the coordinating Tag Along die set. I added a little heart under the sentiment and made it shiny with some Glossy accents. I decided to add some little stars to break up the circle a bit and added some stickles glitter to make them sparkle. 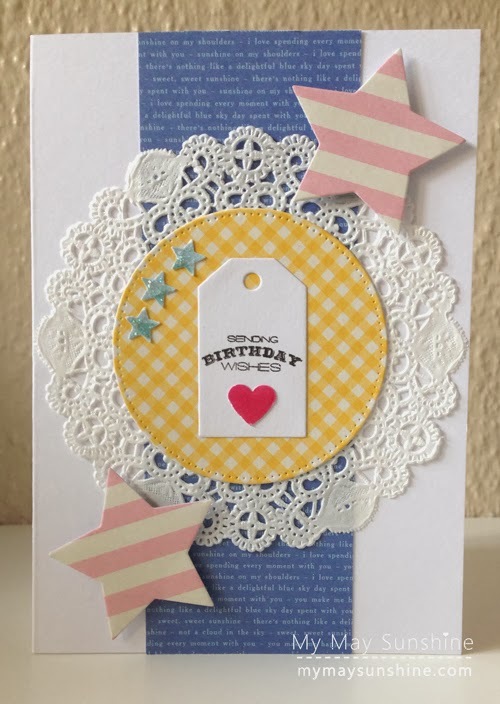 Paper – American Crafts May Berry | Stamp – Clearly Besotted Tag Along | Circle – Die-namics pierced circle | Star – Sizzix framelits stars | Tag – Clearly Besotted Tag Along | Doily – Wilton | Glitter – Stickles crystal | Glossy Accents. Love the colours on this card as I think they make it nice and summery. Hope you are having a great week. See you soon.